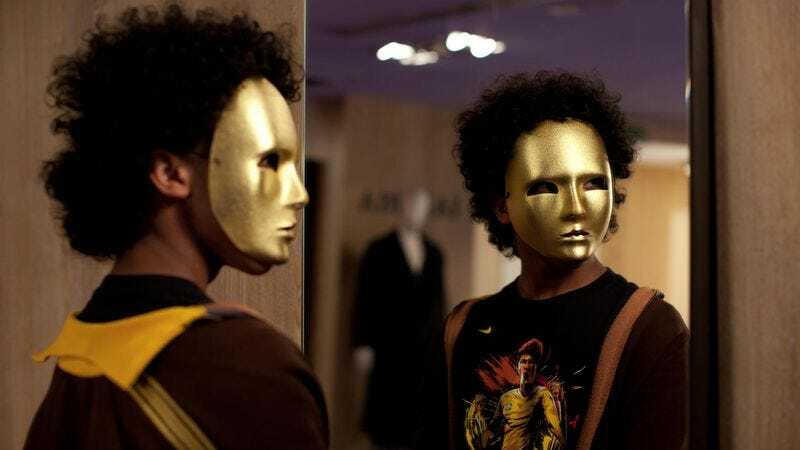 I’m not going to pretend that Bertrand Bonello’s Nocturama is the kind of film that would ever be nominated for an Oscar, even in that strange tide pool of a category called Best Foreign Language Film. It’s more than just an unlikely candidate: It’s an anti-candidate, an unseemly cinematic monster so hopeless that there’s a good chance I won’t have the opportunity to review it or publish the interview I recorded with Bonello last September. By that point, the movie had already flopped hard in France, grossing a small fraction of its budget. It still has no distributor in the United States, and even the most enterprising outfit probably couldn’t fork over the cash necessary to clear the American rights to its fantastically eclectic soundtrack: Chief Keef’s “I Don’t Like,” Willow Smith’s “Whip My Hair,” John Barry’s theme for The Persuaders. It’s a troubling and thrilling movie, pitched somewhere between George A. Romero and Weekend. The first part, just short of an hour long, is this oblique, trancelike suspense film about a teenage terrorist cell carrying out a coordinated attack in Paris, with only the vaguest hint of an ideological motive; the second part, which could be its own standalone feature, follows them to an enormous department store, where they try to wait out the night. (It was shot in the La Samaritaine complex, which some readers might know from Leos Carax’s Holy Motors.) The title that the film was shot under was Paris Est Une Fête—the French title of Ernest Hemingway’s memoir A Moveable Feast, which became a popular slogan in the aftermath of the November 13 attacks in Paris. Hence, it became Nocturama, a semi-obscure term for the building used to house nocturnal animals in zoo, previously the title of a Nick Cave album. Which implies a question: Where’s the zoo? Technically, Nocturama’s lack of American distribution doesn’t disqualify it from Best Foreign Language Film, which is covered by the most bizarre rules of any Oscar category. The award was introduced in 1957, as post-war audiences were becoming more exposed to films from foreign countries; Federico Fellini won the first two, for La Strada and Nights Of Cabiria. This year, it turns 60, and like so many gestures of noblesse oblige made to address a changing a world, it seems antiquated and separated from reality. To be eligible, a movie doesn’t have to play anywhere outside its home country, though it has to be released before the fall. It also has to be submitted for nomination by an approved national body, like a ministry of culture or an awards-giving industry organization equivalent to the Academy Of Motion Picture Arts And Sciences, on a one-film-per-country-per-year basis. These are then voted down a short list, with additional titles hand-picked by an executive committee. The short list is, in fact, very short. This year, nine movies made it through this first phase, four of which will be eliminated in what I imagine is a gladiatorial process to create the final list of nominees. I know this is obvious, but countries tend to make more than one great movie a year. And speaking from a purely statistical standpoint, there’s no way in hell that the majority of good-to-great films made in a given year are in English. This year, the Academy deemed 336 films eligible for its top award, Best Picture, which is significantly less than the number of movies we review here at The A.V. Club in a 12-month period. But as critics, we’re also held to a different standard when we compile our annual best-of ballots; though our readership is international, we’re an American outlet, which limits what we can reasonably recommend (though not what we can see) to movies that were commercially released in the United States. Because of the nature of the business, these tend to be American movies. Every festival-going critic has an annual list of movies they wish they’d been able to vote for, and Nocturama sits at the top of mine. But in its current formulation, the Oscar for Best Foreign Language Film has no such limits. It is a contradiction, being both the most open-ended category and the one with the most restrictive steps. The first is the national one, because while the Academy likes to present Hollywood as a global phenomenon (which it is), it is otherwise obsessed with national cinemas, and sometimes disqualifies national submissions for not being “national” enough. (One case would be Lust, Caution, which was submitted by Taiwan, but rejected as a Chinese-American co-production.) And then there are the selection committees, which now come in two phases, with the first involving both a vote involving hundreds of participating Academy members, and the advisory picks of the committee. This is the most difficult barrier, as the Academy is often stodgier than the national institutions from which it solicits possible nominees. They don’t like anything too avant-garde. In this sense, a movie like Nocturama, one of thousands upon thousands that are abstractly eligible for the category, is eliminated twice over. And perhaps this wouldn’t matter if the Oscars weren’t still the most important in the world—a glamorous and prestigious prize available to only a narrow band of the spectrum of film. Despite decades of submissions, not one film from South Korea—a mid-size country with a very large and varied cinema—has ever been nominated, while Denmark seems to sneak in a nominee every year. As strange as it may sound, the best way to make it fair would be to give it the same restrictions as the other categories, ditching open national submissions and fall deadline to narrow the field just to those films that were released theatrically in American in a given year. I have no qualms with France’s official submission for this year: Paul Verhoeven’s Elle, a truly great film that did not make the short list. (In one of many quirks, it is however eligible for Best Picture.) Maren Ade’s Toni Erdmann did make the shortlist, and it’s very good. So did It’s Only The End Of The World, by the young Quebecois director Xavier Dolan, which is also without a U.S. distributor. I’ve yet to meet anyone who thinks It’s Only The End Of The World is a good film. Maybe it’s just an “I don’t know anyone who voted for Richard Nixon” situation. As for Nocturama, I’ll continue holding on to what I reckon are my my best thoughts about the film in the hope that you’ll be able to see it someday, ideally in a movie theater.